On Sunday, January 27th, 2019, an info event was held att Kafé 44:an in Stockholm about 10 detained and 1 imprisoned comrade in S:t Petersburg and the city of Penza south-east of Moscow. Afterward a solidarity manifestation was held outside the russian embassy in Stockholm. The manifestation was directed mainly toward the ten now detained, but in protest against the total of torture and violence carried out on all 11 originally belonging to the case. About 15 people participated in each event. The gathered were meet by a number of police and were after a shorter turmoil forcibly removed from the entrance of the embassy to a park in the close vicinity. The support events that took place were in solidarity of 10 previously and currently politically active anarchists and antifascists who have been detained since October 2017 and January 2018 accused of belonging to a terrorist network. The network according to russian secret security service, FSB, was planing to attack the elections of March 2018 in Russia, and the following FIFA world cup in the summer of 2018. No such reliable evidence lies at hand today. All detained have been under heavy and systematic torture and violence by FSB and all current evidence in the case has been fabricated under these circumstances. One of the previously 11 detained has worked along to the full with the FSB after longtime torture and he has now been sentenced to 3,5 years in prison. He is not currently supported by the anarchist black cross movement in Russia. We clearly stated during our manifestation that we support movements and activists fighting for economical, political and juridical equality. These movements and activists are under heavy pressure in Russia since 2012 and periodically also in Sweden. We stated that if there would have been planed political actions against the elections and FIFA-games, it would have been a positive thing, depending on the means of how these activities were carried out. To further support the detained in S:t Petersburg and Penza, you can contribute with money to the support fund (bötesfonden). The support fund is run by Fånggruppen Syd, in southern Sweden. 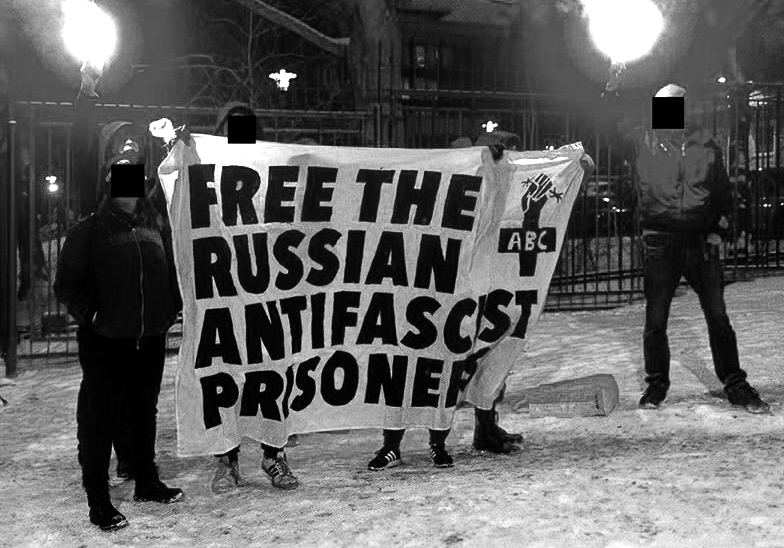 Money is transferred to ABC-Moscow (anarchist black cross) to support the detained with legal assistance, medicines and food. Mark your contribution with: “russia prisoners”. Spread the information! Get involved! It is said these ten people belonged to a terrorist cell with the aims to complete actions against the elections and FIFA-games. The truth is that one of the main political activities of the detained was social work delivering and gathering clothes and food for homeless. It is said that these ten young fellows were a threat to the russian state. We say that basic social work is not a threat but a contribution to the russian society. Our definite and soul purpose of gathering outside the russian embassy this evening is to send a signal to the russian authorities that the fabricated case against the ten detained should be immediately closed, all charges dropped, and economic compensation be given for 16 months of illegal detention. We state that the security services of Sweden and Russia who are most probably closely monitoring our activities today, represent systems of demise and obliviance against basic economical, parliamentary and juridical equality for all citizens alike. We call for you who are here in favor of the detained to be brave and not mistrust. For remember that the louder the gathered crowds yell at the ones to be hung at the gallows, the more it is actually a growing frustration against the leaders in command. A frustration that will at any given moment turn on the leaders themselves holding in the strings to the gallows. Next Post:Toward a general strike in France on the 5th of February?